The ReliefLink app won the $50,000 first prize in an App Challenge sponsored by the Substance Abuse and Mental Health Services Administration (SAMHSA). A team led by Nadine Kaslow, PhD, an Emory University School of Medicine psychologist, has developed a user-friendly mobile app designed to provide continuity and follow-up linkages for persons at risk for suicide. Named "ReliefLink," the app won first prize ($50,000) in the Suicide Prevention: Continuity of Care and Follow-up App Challenge sponsored by SAMHSA (Substance Abuse & Mental Health Services Administration). The app was presented Monday, Sept. 16 at the White House as part of the Behavioral Health Technologies Innovations Conference. The App Challenge asked individuals and organizations to develop an application for a mobile handheld device that will provide continuity of care and follow-up care linkages for a person at risk for suicide who was discharged from an inpatient unit or emergency department. The ReliefLink app includes mood and behavior monitoring and tracking, safety planning, medications and appointment reminders, a help center map locator, built-in coping tools (e.g., relaxation and mindfulness exercise, relaxing radio music), an emergency button that can connect patients to helplines, providers, 911, and friends/family. The ideas for the functions were gathered with a focus group of at-risk persons and members of the community who helped highlight the importance of including specific features in the app. "I am thrilled to be part of this collaborative effort to develop state-of-the-art technology to prevent suicide, a major public health problem," says Kaslow. 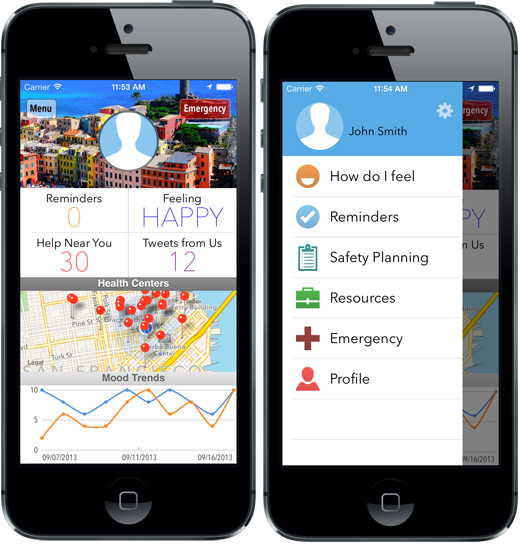 "I am confident that this user-friendly and psychologically relevant app will help people get connected to effective services in the community, keep them safe and prevent future suicidal behavior." Many people who attempt suicide end up in the emergency room. From 2005-2009 there was a 55 percent increase in emergency department visits for drug-related suicide attempts by men ages 21-34, and a 49 percent increase by women age 50 and over. While treatment at an emergency department is critical, experience and research have shown people are still at high risk after discharge, and the period directly after discharge is particularly important for transition of coordinated care, follow-up treatment and continued connection. "Our suicide prevention app is an innovative effort that tries to marry the art and science of mental health care with cutting-edge mobile technology," says Lu Dong. "Though the majority of us are benefiting from the drastic advances in mobile technology in our personal lives, introducing the use of mobile devices in mental health practices is still a new territory with great potential, and suicide prevention is such a vital public health issue. Mobile phones are extremely helpful in immediately getting connected with services and resources, staying in touch with friends and families, and getting important reminders. "We have thousands of well-designed games on the app store, but not a single decent app aims at saving people's lives. A smartphone can bring people entertainment; it should also bring help to people in need. We hope that one click on the smart phone can save a life." "It's an exciting time for the intersection of technology and health," says R. Shawn Williams "It was a great opportunity to collaborate with Dr. Kaslow, Stephanie Johnson and the Emory Department of Psychiatry and Behavioral Sciences at Grady Health System to apply new app trends such as gamification, personal acccountability and peer interaction to suicide prevention." SAMSHA will use the winning apps from the contest challenge to develop a combined app to reduce suicide risk. Emory will continue to move forward with ReliefLink and partner with local cell phone companies to develop the app for use by mental health patients and college students.